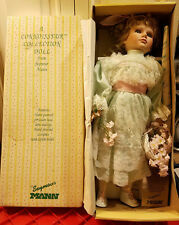 Seymour Mann Connoisseur Collection 18" Doll .
" Jester ". A Connoisseur Collection. Seymour Mann. In Original Box. New Listingset of 2 SEYMOUR MANN PORCELAIN DOLLS. Set of 2 SEYMOUR MANN PORCELAIN DOLLS. They are 13 and 10 inches tall. Not in perfect condition but very cute and a bath would do these 2 girls wonders. Pre owned from a non smoking home. Thank you.
" Delores ". Made for Cracker Barrel. 24" Porcelain Doll. Seymour Mann Joanie Doll. Also, one doll's shoes are scuffed. Lovely painted face. Dark ringlets. VINTAGE LOT of 3 PORCELAIN DOLLS. Condition is Used. Shipped with USPS Priority Mail. The doll is in great condition, clean and in the original box. The COA is included with the doll. Audrey Bride Doll - She stands 17" tall. Seymour Mann Limited Edition Connoisseurs Collection. Sure to delight any doll collector or young lady. Estate find - New and in original box with COA. She is a Seymour Mann, Maud Humphrey from a LE collection. She is made of bisque and cloth. Seymour Mann Connoisseur collection 20" porcelain doll, with stand. Faux pearls on the dress. There were no boxes. The Seymour Mann Connoisseur Collection can be found behind the neck. Except for slightly fuller eyelashes on the left eye, this doll is in pristine condition. VINTAGE LOT of 7 PORCELAIN DOLLS - SEYMOUR MANN In Boxes With Certificates. Condition is Used. Shipped with USPS Priority Mail. She was a gift, but never removed from her box. But she was probably reboxed into a Kingstate Dollcrafters box. No certificate. Tags found on doll are pictured. LOCAL PICKUP IS ALWAYS AVAILABLE. BEAUTIFUL BLONDE WITH CURLS. BLUE EYES. ANGELA Doll New in Box. Item # C-3084. Doll has Blonde Hair with blue eyes and is wearing a blue dress with pink trim and lace detail. This is a limited edition doll with 2,500 sold. Doll features hand painted porcelain head, arms & legs. EASTER BUNNY ~ RAGGEDY ANDY & ANN/CLOWN ~ Seymour Mann Connoisseur ~. Limited Edition.Hand Crafted by Artisans in China. Adorable 10" twins porcelain dolls by Seymour Mann. New in box ! Only listed as used because box was opened. All of my dolls are in like new condition, well cared for and never played with. This is a cute17” angel doll with wings that is a limited edition from 1996 and is numbered “27/1200”. This doll has a beautiful face with big eyes with applied top lashes. Her blonde wig feels like real mohair. Seymour Mann Connoisseur Collection Porcelain Hyacinth Doll With Stand VTG. Condition is Used. Shipped with USPS Priority Mail. From The Seymour Mann Studios. It is from the Connoisseur Collection. I try to describe the item as good as I can and take pictures to show all aspects of the item. 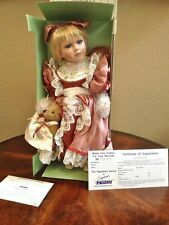 51wk Seymour Mann Connoisseur Collection Doll 15"
The doll is porcelain and is in good shape. The doll is dressed in a white gown. All net proceeds go directly to that effort. We will do our best to correct the situation. Northeast Kansas. You’re required to bring your invoice with the item number in order to pick up your item. Seymour Mann Connoisseur Collection 1992. "Vanessa" Porcelain Bridal Doll from the. Vanessa stands 17" tall. She is hand crafted with aporcelain head, arms and legs and a stuffed body made of fabric.She has dark reddish brown hair, glass green eyes and hand painted face, bust, arms and feet. He appears to be dressed either as Raggedy Andy or a clown based on the red yarn hair and the nose makeup. Only taken out of box for photos. It also includes a doll stand and the certificate of authenticity. This doll is in good condition. By Seymour Mann MCMXCVI. The Connoisseur Doll Collection. Boy & Girl Doll. Stands not included. SEYMOUR MANN CONNOISSEUR PORCELAIN DOLL KERRY with COA & Stand 19" ~ NEW! Kerry Doll New in Box with stand. Doll has Red / Auburn Hair with blue eyes and is wearing a blue dress with pink trim and lace detail. She also has pink flowers in her hair. This is a limited edition doll with 2,500 sold. DOLL IS 21" TALL AND BEAR IS 5.5" TALL IN THE SEATED POSITION. DOLL IS NEW AND NEVER PLAYED WITH. DOLL & BEAR ARE IN BEAUTIFUL CONDITION. Seymour Mann Connoisseur Doll Collection - Honey. shows no sign of use. Mann sticker still on bottom of her shoe. This was located with a few other collectible dolls. This lovely 16” Seymour Mann doll, “Paula,” is from a limited edition run - one of only 2500 made. Her head, hands, and feet are porcelain and her torso and parts of limbs are cloth. 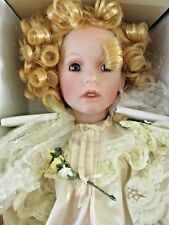 She has blonde curls, and delicate facial features including lifelike green eyes and mauve painted lips. Her beautiful Victorian-style dress is in excellent condition, as are her pantaloons, shoes, and stockings. Comes with stand. 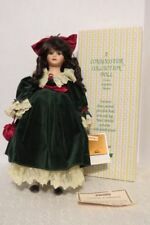 This would be a wonderful addition to a doll collection or a great first doll for a young beginning collector. Comes from a smoke and pet free home. Thanks for looking. VTG Seymour Mann Connoisseur Collection Porcelain Doll With Stand 18" "Lori"
New VTG Seymour Mann Connoisseur Collection Colleen Porcelain Doll With Stand "Lori" 18". The actual item(s) you will receive is shown in the pictures. I WANT YOU TO BE SATISFIED. I TRY VERY HARD TO BE AS ACCURATE AS POSSIBLE, HOWEVER, I DO REALIZE I MAY MAKE HUMAN ERROR. seymour mann dolls Limited Edition Vinyl Doll. Condition is Used. “My special angel” limited edition. I do see some staining on the pantaloons. This is from storing the doll. She was never played with. Shipped with USPS Priority Mail. SEYMOUR MANN PORCELAIN DOLL COLLECTION CARLA NIB COA. Condition is New. Shipped with USPS Priority Mail. Rare Hard to Find Seymour Mann Limited Edition Porcelain Ballerina Ballet Doll ~ Lullaby Baby Connoisseur Collection Doll. This beautiful doll is dress in white from head to toe. She is about 9" High from Toe to Head and 6" From Hand to Hand. Lovely limited edition of 2500 pieces porcelain doll with infant from Seymour Mann's " Connoisseur Collection " .Certificate of Authenticity. Doll is 14" tall . Box in excellent condition . Doll never displayed . Brand new in boxes. Storybook Tiny Tots limited edition collection. 10" Dolls and doll stands included. Dorothy, Tin Man, Lion and Scarecrow. As you can see in the photos she has a head full of cascading golden brown curls, blue eyes and long eyelashes. A must have for the serious collector. Seymour Mann a Connoisseur Collection Doll MCMXC. COA INCLUDED. THIS EDITION LIMITED TO 2500 DOLLS. Angel's Touch Collectibles From The Seymour Mann Signature Series. Marguerite is dressed in an elegant black gown with cream accents and lace with a lovely face, earrings and a beautiful hairstyle with matching hat. Simply amazing details. Porcelain face, hands and leg bottoms. "Country Pinafore" NANCY. Seymour Mann Connoisseur Collection porcelain doll. Defects, if any, will be noted. 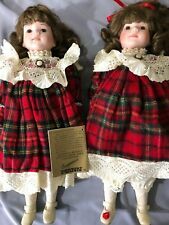 set of 2 SEYMOUR MANN PORCELAIN DOLLS.